Want better internet than you have at home for your trip to Japan? We’ve got you covered with our high speed & unlimited data offer. 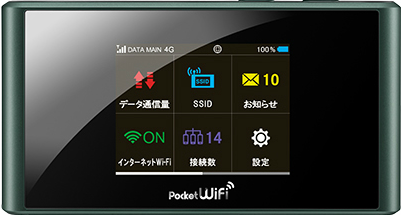 All our Pocket WiFi orders now come with unlimited data for your whole trip in Japan. The possibilities are endless, live stream your trip to your friends, set the world record of Instagram uploads or spend your entire trip watching cooking shows in Netflix. While those options may not be for everyone, using the Pocket WiFi is super convenient. Use it to post and stay connected using social media, make free calls using Skype or similar programs, see travel tips on Youtube and never get lost as you can check transport schedules online and navigate using Google maps. That’s all possible with Pocket WiFi in Japan. To make use of this offer, simply place an order at www.jrpass.com/pocket-wifi or by clicking here. The Pocket WiFi can be connected to multiple devices at once, so you can share it with your whole travel party. -The JR Pass was the smartest thing we did on our trip. We used it for Shinkansen trips from Narita to Tokyo station, Tokyo to Kyoto, and vice versa. We also used it for all Yamanote trips, and even for a few trips within Kyoto. Additionally I now swear by the pocket WiFi. Having access to Google Maps and Google Translate at any moment of the trip made everything so easy, and the price was great. -This is the easiest way to get around Japan and Tokyo. Even if it you spend a little more to use the JR Pass versus buying individual tickets, you’ll save a ton of time and energy trying to navigate the ticket buying process. The JR Pass, along with renting a WiFi device through them, made navigating Japan super easy and fun. -Ordering my rail pass online was very easy, and the pass was delivered to me in good time. Activating the pass in Kyoto Station was also easy, and the agent also helped reserve tickets and seats for the trains we wanted to take. My travel companion managed this in Japanese, so I don’t know what it would have been like if we’d had to rely on using English. I also really appreciated being able to order a pocket WiFi through Japan Rail. Get your Pocket WiFi Now! Valid for all orders placed until the 30th of April, 2019.